After all, not only do we have what are sure to be hotly contested national elections coming up, but the seismic global political shifts that have occurred over the past two years continue apace as well. There can be no doubt that the one thing we can all count on as we move forward is change. This was true last year and is likely to be the same again in 2019. 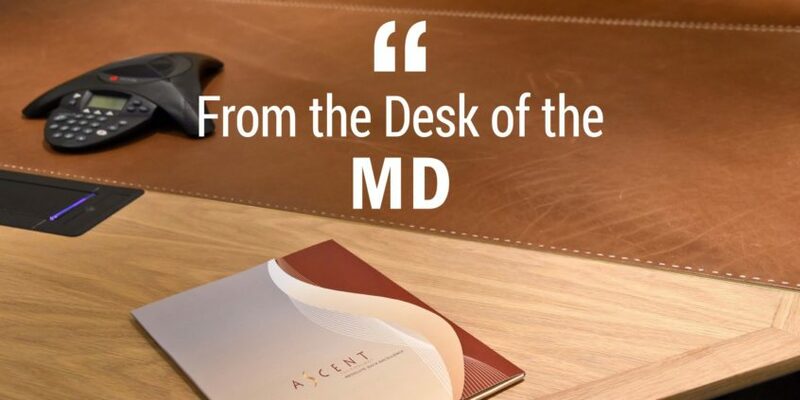 From our point of view, Ascent too is undergoing change and we are certainly excited about the forthcoming year. We are witnessing greater uptake of our various offerings and view this as a platform to once again further increase our capacity, skills levels and our ability to service our clients. This is not to say that things will necessarily be easy in what clearly remains a challenging economic period, but we are certainly optimistic about the near future. Having begun our international expansion in 2017, we are pleased that this has continued at an acceptable pace since then and is proceeding as planned. What is particularly pleasing is that we are now beginning to receive contact from organisations outside of our traditional Middle East and Africa (MEA) area of focus, which clearly demonstrates that the demand for the services we offer is increasing across the globe. As acceptance of the remote Co/Outsourcing Services Model and the demand for Data Platform Management and Consulting Services continues to grow, we anticipate holding an increasing number of conversations around these subjects with clients from all over the world. With multiple Hyperscale Cloud Services Providers readying local data centres for launch this year, it is clear that the acceptance of cloud computing as a mature technology and business model within South Africa is nearly complete. As leading players like Microsoft finalise the launch of their data centres in-country demonstrates that South Africa is now being placed squarely on the global map and is considered a key market internationally, Ascent is certainly witnessing an increasing uptake amongst its own client base. Cloud Computing Services is a big part of what Ascent does and is something that is an integral part of our operations and services, which means our organisation is well placed to assist clients in unlocking the additional value the public cloud will bring to their businesses. Of course, while acceptance of the public cloud is at an all-time high, we understand that different clients are at different stages in their own cloud adoption journeys. As a Microsoft CSP Tier 1 Partner (CSP1), Ascent is ideally positioned to walk this journey with its clients however far along in it they may be. With our skills and experience, we are ideally positioned to not only assist clients to define and build their desired cloud solutions, but we are also able to add further value by offering them the opportunity to consume their Microsoft Azure Cloud Services via Ascent. Ascent Technology continued its strong showing in the Microsoft Partner of the Year awards in 2018, winning both the IP Co-Sell Partner of the Year and the Best New Practice Partner of the Year awards, along with receiving three other finalist nominations, namely:. We are particularly pleased with these latest awards, as these were key areas we identified to tackle a year ago. Winning these accolades demonstrates the strength of our focus over the past year, as well as how we have succeeded in these fast paced areas. Moreover, recognition of this sort from Microsoft indicates to our clients that we are the ideal partner to assist them in their move to the public cloud. As mentioned earlier, while we are positive about the future, we can still expect some challenging times ahead, as the world truly begins to digitally transform. This can already be seen in Microsoft’s own transformation into a platform organisation. This plays to Ascent’s strengths, as our model of Co/Outsourcing Data Platform Management and Consulting Services is a mature one and offers our clients a value-add model that is perfectly capable of handling the increasing demand for our skills. In fact, we expect the demand for Enterprise Data Platform Services to significantly increase in the next year or so, as more and more South Africans begin to work remotely. It has been suggested that by 2020, some 50% of the SA workforce will be remote, which is in line with the way global trends are moving as well. The growth of public cloud, which is the ideal platform to deliver these remote services, is leading to a revolution in the way businesses are choosing to operate. We are now starting to see a centralisation of infrastructure into the cloud, which in turn is driving the decentralisation of the workforce. Optimisation and efficiency are also likely to be key focuses for most enterprises in 2019, and both of these drivers dovetail perfectly with the services we provide, meaning we are ideally positioned to capitalise on the ongoing change that is taking place in the market. As both the market and Ascent itself evolves, we remain grateful to our clients for entrusting us with one of their most important company assets – their data – and we are looking forward to continuing to provide Absolute Data Excellence. As an industry leader in this space we will continue to service our clients in the manner they have become accustomed to. This means providing them with a technology independent, multi-platform trusted partner, that is able to assist them with all their Enterprise Data Platform needs. Lastly, we would like to take this opportunity to thank all our clients for their trust and for the long-term relationships this trust has enabled us to build with them. It appears as though 2019 will be another year where the old adage that ‘the only constant is change’ will ring true, and therefore partnerships like those we have with our clients will only become more crucial. We are certainly looking forward to a successful year and wish all our clients the greatest success during 2019.